Common Mistakes: Olympic Ratings Up - But Why? 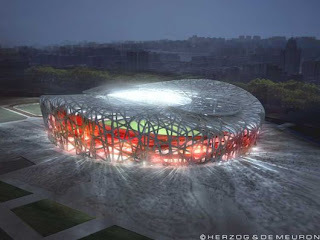 The "birdnest," as the Olympic stadium is called, is a masterwork of aesthetics and engineering. 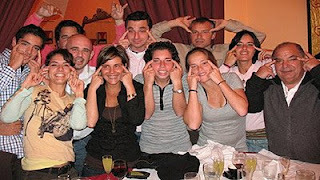 The Spanish women's tennis team, like the men's basketball team, inexplicably mock their Chinese hosts (SkyNews). Michael Phelps ties Mark Spitz's record for most golds BY 1-100th OF A SECOND! in the men's 100M butterfly (Chinaview News). No doubt, NBC is beating records with Olympic ratings. The first five nights scored 15 million more viewers than 2004. I think there are reasons both obvious and not so obvious. Obviously, gas prices are higher, the economy is in the tank, so staying home watching TV - especially with something like the Olympics - only makes economic sense this year. 2. The grace, beauty, and efficiency of the Chinese in staging the Olympics have made this one of the most entertaining ever. It's always a thrill to see the Acquatics building or the "bird's nest." 3. 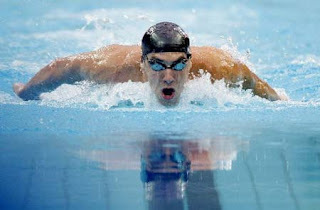 Michael Phelps' ambition to beat Spitz's record as the most gold-winning Olympic athlete ever gives this Olympics a special air of suspense. And so far, Olympic USA swimmers have been winning in most suspensful fashion, giving us not one but so far two breathless down-to-the-wire come-from-behind wins. But aside from stay-at-homes and swimming suspense, there's another good reason this year's Olympics are being watched by more people than 2004. And that's all those high-resolution, big-screen TV's that consumers have bought over the past three years. Finally, one can watch an Olympics as it truly ought to be seen: a big-screen event. And finally, there's something worth watching on those big galloots of TV's we all shelled out dearly for the past three Christmases.